Some time I was out from EB, but I’ve come back with new MOC :) I had short of time that’s why its construction took about two monthes. This is my tuning-version of legendary Ferrari Enzo. The scale is 1:8.5 (length – 58.5 cm, width – 24 cm, height – 13 cm), total weight – 3.6 kg. Design combines various features of original Ferrari, tuning-versions Edo Competition, MIG-U1 and my own ideas. - clearance adjustment (four large pneumatic cylinders) – 1 x M.
The scale is approximate with respect to wheels. Front wheels – 81.6 mm from 42000, rear – more aggressive tires from 8461. The transmission differs from original one. For better playability and transmission load decreasing i’ve mounted AWD. In the same time central differential gear is an output gear of gearbox. Two-stage gearbox allows to drive both on the flat surface and on slight off-road. I’ve mounted two air tanks to decrease switching time. The acceleration is realized on adders (two parallel circuits for reliability increasing). The adders can be locked. Instead of velocity locked adders sums the torque. The next feature of my model is adjustable clearance on both axles (original Ferrari Enzo has only front axle lift). Vertical rods was replaced by shock absorbers and pneumatic cylinders are mounted at horizontal angle. There is an adaptive aerodynamic element in my model – it is rear spoiler that is switched simultaneously with gear box. This is unbelievably amazing!! Can't wait for the video. Great Job! Great work. Headlights are cool. Wow I am impressed with all the details you added in! I am especially interested with the adder setup you were describing. Would you mind explaining it a little more to me? Woow, i am amazed. This is a great mix between Technic and normal Lego ! Wow. What a good looking, yet complex model! This looks so cool. Great work! I am especially interested with the adder setup you were describing. Would you mind explaining it a little more to me? Very nice, thank you for sharing it with us! How much is the final vehicle slowed down by the additional weight of the bodywork? +1 for tiles on the doors and green headlight delete. Amazing work! I'm most impressed that you managed to build a studded model an odd number of studs wide! Brilliant! The body and chasis are complicated enough without the added features. You've packed a lot in there. Well done and thanks for sharing your diagrams. You need to put that in brickshelf. Yes, i had some doubts about it but lime strips improoved its perception. Now i am waiting for a BL order with other windscreens - maybe i'll create something better when i'll get it! How much is the final vehicle slowed down by the additional weight of the bodywork? 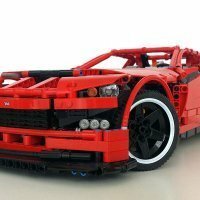 One of the best Lego Technic Supercars I have seen on while! Impressive work, thanks for sharing. Tell me please, I'm in a series Technic beginner and do not quite understand how you manage remotely pneumatics? 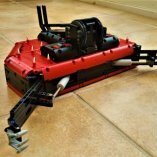 Using servo motors? On this model you used all available channels 8 PF or there is what is the secret? In this model i use two variants of RC valves - servo-motor works fast, so i use it for gear shifting (i control it by using RC unit with speed control). M-motor is used for car lifting. Yes, i use all eight channels - 4 XL motors (one motor per channel) and other four functions takes remained channels. I think I just beginning to understand that as a yes. But I did not converge with the function of channels PF! If you have a transmission with low and high gear ratio, why waste one channel in separate motors for acceleration? And you have a very difficult box for vsegolish two speeds! Wanted to say thanks on this forum people are more hospitable and open, willing to help and share their ideas. It is very nice! This transmission gives a little more than simple two speeds. In fact here we have four speeds (low,low+acceleration,high,high+acceleration). For example to get "low+acc" speed from "low" speed we don't need any gear shifting so model don't slows down before acceleration. In addition we can increase a torque and it can improve flotation or, for instance, works like a handbrake on slopes as shown in the first video. I've created a video-demonstration of this model... hope you like it! I don't know if you have seen it already, but I suggested this exceptional MOC to The Lego Car Blog and it was excepted.